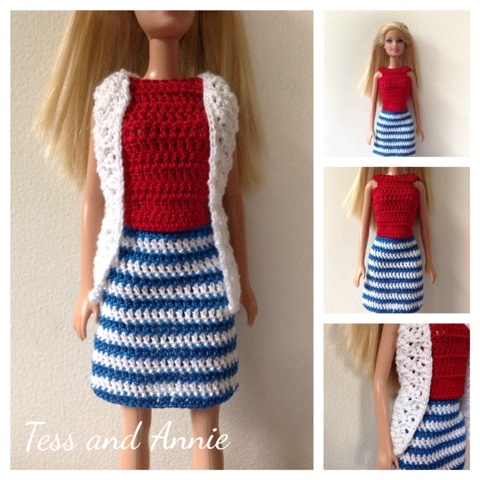 Here is the Red, White, and Blue outfit for Barbie! Enjoy the pattern! Note; v-st = (dc, ch 2, dc) in st indicated. Row 1: (with blue) Ch 43, dc in 4th st from hook, 1 dc in each st across, turn. Row 2: Join on white, ch 3, 1 dc in each st across, join to 1st st, turn. Rnd 3: Pick up blue, ch 3, 1 dc in each st around, join, turn. Rnd 4: Pick up white, ch 3, 1 dc in each st around, join, turn. Rnds 5-15: Repeat rnds 3-4 alternately. Fasten off. Row 1: Ch 43, dc in 4th st from hook, 1 dc in each ch across, turn. Rows 2-9: Ch 3, 1 dc in each st across, turn. Row 10: Ch 3, 1 dc in each of the next 9 sts, ch 10, skip 5 sts, dc in next 12 sts, ch 10, skip next 5 sts, 1 dc in each st across, turn. Row 11: Ch 3, 1 dc in each st across, turn. Row 12: Ch 1, (sc dec) across, fasten off. Row 1: Ch 43, dc in 4th ch from hook, 1 dc in each ch across, turn. Row 2: Ch 1, (sc in next st, skip 1 st, v-st in next st, skip 1 st) across, turn. Rows 3- 20: Ch 1, (sc in ch 2 space, v-st in next sc) across, turn. Row 21: Ch 1, (sc in ch 2 space, v-st in next sc) 2 times, ch 10, skip next v-sts, v-st in next sc, (sc in ch 2 space, v-st in next sc) 2 times, ch 10, skip 2 v-sts, v-st in next st, (sc in ch 2 space, v-st in next sc) to end, turn. Row 22: Ch 1, Ch 1, (sc in ch 2 space, v-st in next sc) across, turn. Rows 23-24: Ch 1, sc dec over 1st 2 v-sts, (sc in ch 2 space, v-st in next sc) across, to last 2 v-sts, sc dec over last 2 v-sts, v-st in last sc, turn. Row 25: Ch 1, sc in each v-st and sc across, DO NOT TURN, sc down side of piece, turn, sc across bottom of piece, sc up side of piece, join to 1st st. Fasten off. Weave in all ends.